Simonis UK 6ft or 7ft Pool Cloth - Bed & Cushion Set Various Colours. As the UKs main Simonis cloth importer we are delighted to offer packs of 6ft or 7ft English pool size cloth. 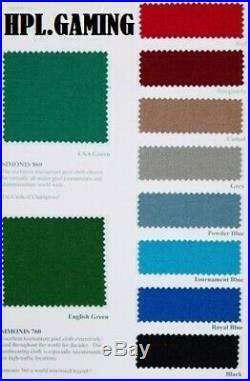 We have a host of colours available in either the famous Simonis 760 or 860 cloth. All our sets include a 1 x pre cut 6ft or 7ft bed cloth and 6 x pre cut to size cushion strips to allow easy recovering. PLEASE BE AWARE - It is important to know what size pool table you have before ordering. When we talk about 6ft or 7ft size cloth we refer to the overall table size (not the slate size). A UK 6ft or 7ft pool table means that the length of the overall table cabinet is 6ft or 7ft and not the actual slate size. We do show the cloth cutting sizes below and we strongly recommend that you thoroughly check the required dimensions before you order. Simonis cloth is regarded as the finest speed cloth on the market. It is used in the majority of 9 ball professional events throughout the world. Although this type of cloth is mostly found on the larger American pool tables it is also popular on UK models that require this faster type of cloth. Simonis have two flagship makes of cloth. This cloth is called Simonis 760 or Simonis 860. We stock certain colours in different types of this cloth. When ordering your colour from the dropdown menu you will see if the cloth colour is stocked in either 760 or 860 finishes. The basic difference between 760 and 860 is the ratio of wool and nylon in the cloth. The 760 cloth has 30% nylon and 70% wool. The 860 has 10% nylon and 90% wool. This means that 760 is slightly faster and more hardwearing cloth than the 860. 760 cloths tend to be the choice for UK pubs and 860 is mainly used in professional events. Below is more detailed information about these two styles. The Simonis 860 cloth is used in nearly every professional 9 ball tournament throughout the world including The Mosconi cup and the GB 9 UK Tour and many more. This championship cloth is made from 90% wool and 10% nylon and weighs 410 g/m2. It provides a true, fast, quality playing surface. It not only looks great but will ensure the best possible performance from your table. Simonis 760 cloth is very popular with UK pubs. It is made up of 70% wool and 30% nylon. The extra nylon in this cloth ensures it is very hardwearing and tough. It provides a fast true game and will outlast many inferior cloths. This cloth weighs 355 g/m2. Manufactured by Iwan Simonis in Belgium for over 225 years this world class cloth is chosen for virtually all major American pool tournaments seen on TV today. It should be the only choice if you love the game of pool. If you wish to view the impressive listing of worldwide prestigious events that use this great cloth we would recommend visiting the Iwan Simonis official website. Simonis sole business is the manufacture of billiard cloth. This means that with over 225 years experience it is safe to say that they really are the true specialists when it comes to making pool cloth. Worsted cloth or speed cloth as it is more popularly known has a napless surface which means it is a non directional cloth which produces a true, fast and hard wearing surface. This will provide the best possible game surface for your table and game. Made from wool & nylon this cloth ensures great control combined with playability and precision. In check out please state what colour and size 6ft-7ft you require. Also specify if you are going for the 760 or 860. The item "Simonis UK 6ft or 7ft Pool Cloth Bed & Cushion Set Various Colours" is in sale since Wednesday, February 13, 2019. This item is in the category "Sporting Goods\Snooker & Pool\Table Brushes & Accessories".1" and is located in Pwllheli. This item can be shipped to United Kingdom.